A romance sparked by war: General Pershing and French-Romanian artist Micheline Resco- Two important “history moments” surfaced during my five years of research on the documentary “Black Jack Pershing: Love and War.” It involved the romantic relationship between U.S. WWI Commander John J. Pershing and portrait artist Micheline Resco. Since I haven’t had the pleasure to see you today, I’m worried that you’re suffering, which weighs on me regularly. Please accept, mademoiselle, my respectful compliments and all the best wishes toward your swift recovery. Inside the envelope of Pershing’s letter to Resco, I found rose petals the General tucked into his now 100-year-old love letter. 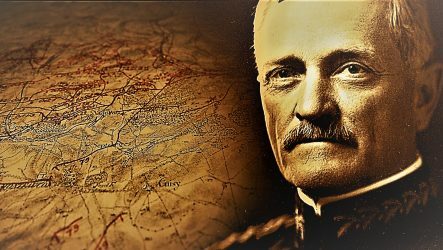 A year later while searching through some 400 boxes of Pershing’s personal records at the Library of Congress in Washington, D.C., I found some of Resco’s love letters to General Pershing. In a folded letter Resco had written to Pershing in late summer of 1917, Micheline wrapped lilac petals and candid photos of herself. Here is a photo of Micheline Resco’s love letter to General Pershing that the flower petals and photos were enclosed with. It was to be the beginning of 30 years of letters between Pershing and his lover Micheline who insisted on staying hidden out of sight deep in the background of Pershing’s public life both during and after WWI. After the war, the two visited privately between Pershing’s home in America and Resco’s in France when their schedules allowed. They also wrote frequently. Often they used coded telegraphs to disguise their romantic relationship. This was especially the case as the threat of World War II loomed in the late 1930’s. By then, Pershing was nearing the age of 80. Example of a coded telegram sent from General John Pershing (Beatrice) and Micheline Resco (Cheliner). One of the secret code books General John Pershing and Micheline Resco shared that they used to decode messages telegraphed between the couple. Another “history moment” I encountered dismissed any doubt I may have had over the love Pershing and Resco shared for each other. At the Jesuit Archives, I found the license for the couple’s secret 1946 marriage. A Catholic priest married the couple in Pershing’s apartment at Walter Reed Hospital in Washington, D.C, 11-days shy of Pershing’s 86th birthday. What a beautiful love has been ours. As my companion in life, you will be with me through eternity. So, do not weep, be brave. Say not good-bye, but say good night. In all the future, the lingering fragrance of your kisses shall be fresh on my lips. A copy of the letter General John Pershing asked be delivered to his wife Micheline Resco after his death in 1948. Pershing had written the letter in the 1920’s, a few years after the couple had first met in France during World War I. After his death, Pershing also left behind a small locket. Pershing’s granddaughter-in-law Sandra Pershing shared it with me in 2016 when I interviewed her for the documentary in New York City. The locket held two photos. One was of his son Warren. The other of Pershing’s wife Micheline. A romance that blossomed into a love had survived a world war. It was a love that also endured through the lives of General John Pershing and portrait artist Micheline Resco.